A “direct benefit to our area charities,” no way, Tom–it provides a direct benefit to businesses and an indirect benefit area charities and food banks at a cost to the treasury. H.R. 644 would amend the Internal Revenue Code to permanently extend and expand certain expired provisions that provided an enhanced tax deduction for businesses that donated their food inventory to charitable organizations. The enhanced deduction for food inventory contributions expired after December 31, 2014, and applied to sole proprietors, partnerships, and other businesses not organized as C corporations (which are already permanently allowed an enhanced deduction under more general provisions of current law). H.R. 644 would also expand the maximum deduction for all businesses by allowing deductions of food inventory donations up to 15 percent of the net income of the donating organization, an increase from the 10 percent allowed permanently under current law for C corporations and allowed previously for other businesses. In addition, the bill would allow certain businesses to make alternative assumptions about the cost basis and fair market value of donated food inventory. The staff of the Joint Committee on Taxation (JCT) estimates that enacting H.R. 644 would reduce revenues, thus increasing federal budget deficits, by about $2.2 billion over the 2015-2025 period. Tom says he seeks to “meet the needs of those in our community who suffer from hunger.” Tom forgot to mention that he was unconcerned about hunger when he supported a farm bill which defunded SNAP–food stamps. Evidently Tom’s concern about hunger and his concern about the budget deficit are secondary to his interest in enacting more tax breaks for business. Adequate Funding for SNAP, SSDI and other such programs. Should Tom’s bill pass House and Senate, President Obama has proposed a veto because the proposal is unfunded. I understand why the Food Bank supports H.R. 644, but I think they are wrong to associate their good name with Tom Reed’s political ambitions by hosting his press conference. This entry was posted in Congress, Economics, Farm Bill, Political, Reed's Views and tagged Food Bank, H.R. 644, Hunger, Poverty. Bookmark the permalink. Thanks for unpacking the bill. It really is a giveaway for business isn’t it. The Food Bank of the Southern Tier is also left to beg harder for out of date food from private donors, while the businesses get the gift. Even in charity, Tom Reed has no charity. Charity ought to be given willingly, but in this case the charity is taken from the public in the form of a tax break for business whether the public likes it or not. More tax breaks for his big donors….he doesn’t show an ounce of empathy. This is quite typical of the “new” GOP economics. If a business does not plan properly and has an excess of inventory (food, in this case),instead of taking a loss for poor management practices they can pass on that excess inventory at a cost to the tax payer (by cutting their own taxes). Adam Smith is rotating rapidly in his grave. 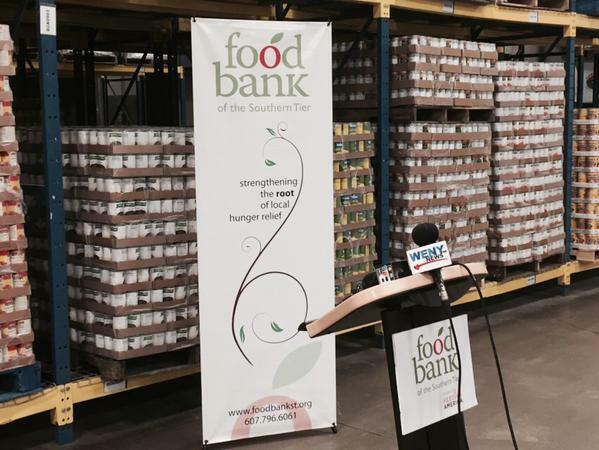 some food banks won’t take ” out of date food ” the donor could be sued. If Reed really wanted to help the hungry he would have supported the programs William had listed. I can’t wait until Reed complains about the deficit. Yes Bob, I put your other comment in the trash. ” but in this case the charity is taken from the public in the form of WELFARE, whether the public likes it or not. YOU MEAN, don’t you ? No, Bob, I wouldn’t know exactly how much product would be sold. Which is why I don’t pretend to be a “laissez-faire” capitalist. You miss the point. The phony capitalists want it both ways. They want to claim a “free market” economy, until it doesn’t work for them. Then they want the government to bail them out. (Oil companies have been getting oil depletion allowances for decades. Big agriculture is paid billions not grow crops and given price supports. )I have no problem with temporarily helping businesses during a down cycle. But the proponents of big business never seem to want to help workers during a down cycle. It cuts both ways.